Juan Manuel Fangio, Toulo de Graffenried and Robert Manzon signed photo. The photo shows Juan Manuel Fangio (1911 - 1995), Toulo de Graffenried (1914 - 2007) and Robert Manzon (1917 - 2015) watching a race together in the late 1980's. 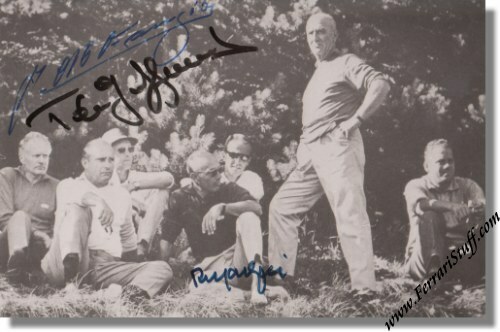 All three gentlemen have signed this photo. This signatures are 100% guaranteed original. The photo measures 6 x 4 inches or 15 x 10 cm. Only 1 available of course as every autographed item is unique. We provide a Certificate of Authenticity with it which guarantees that these are genuine signatures.